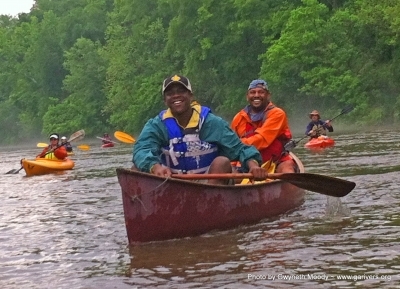 A 48-mile water trail along the Chattahoochee River. 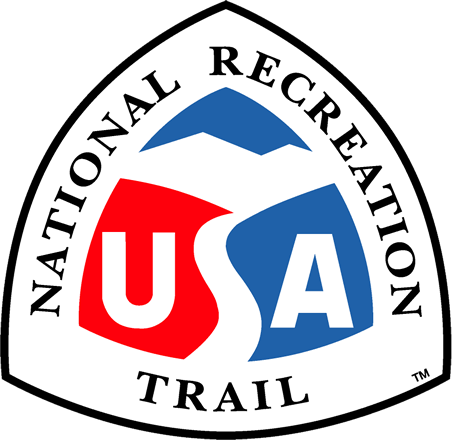 The water trail is contained within the Chattahoochee River National Recreation Area that includes the river and certain adjoining lands in the State of Georgia from Buford Dam downstream to Peachtree Creek. The river remains a cool temperature year-round, rarely getting warmer than 50 degrees Fahrenheit. The Chattahoochee River is the southernmost trout stream in the US. Many access points from Metro Atlanta. Start your visit at the Island Ford Visitor Contact Station. See www.nps.gov/chatt The river is accessible by boat North of Morgan Falls Dam at Bowmans Island [34.1583deg N; -84.0774deg W], Abbotts Bridge [34.0244;-84.1718], Medlock Bridge [33.9959;-84.2027], Jones Bridge [33.9988;-84.2478], Chattahoochee River Park [34.0022;-84.3620], Morgan Falls Dam [33.9654;-84.3822], Johnson Ferry [33.9457;-84.4042], Power Island [33.9041;-84.4421], Paces Mill [33.8704,-84.4526]. The 48 miles of the Chattahoochee River National Recreation Area is available for raft, canoe, kayak, motor boat and other small boat use year round. Jet skis are not permitted at any time. The river remains a cool temperature year-round, rarely getting warmer than 50 degrees Fahrenheit. The river within the park is open for boating from 30 minutes before sunrise until 30 minutes after sunset. Night boating is not permitted in the park. The river offers excellent opportunities for leisurely paddling a raft, canoe or kayak to observe wildlife and wildflowers, do some fishing, or simple relaxing recreation. On days when Buford Dam is not releasing water, the river below the dam is calm "flat water" with an occasional class I/II shoals or rapids. Even if you don't have your own boat to use, there is equipment available for rental. 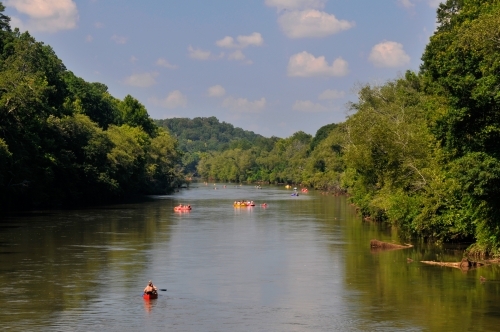 The Chattahoochee River National Recreation Area does not rent boats, however there are several authorized outfitters that rent canoes, kayaks, rafts, and tubes for day use on the river. The entire 48-mile-long corridor runs along the Brevard Fault Zone, which forms the Chattahoochee River channel. It forms, in part, the dividing line between two physiographic provinces: the Appalachian Mountains and the Piedmont Plateau. The mixed habitat types within the old and stable Chattahoochee River channel form a biological link with the Appalachian Mountains. This has resulted in high biodiversity within the adjacent park. The park provides a scenic river corridor with opportunities for natural solitude and seclusion within relatively undisturbed forests, wetlands, bluffs, ravines, and open water areas. To provide the public with information about the NRA, the park provides visitor contact stations staffed by rangers, a website, and a Chattahoochee River Guide that provides access locations and natural & cultural resource information. Signage is present at trail heads, mile markers are visible on the river, and geographic signage is on bridges and crossings. Flow rates and conditions and water quality status are provided through several partnerships that are available on different web sites for public information. Paddle Georgia 2014. Photo by Gwyneth Moody. Water Trail Play Date. Photo by Gwyneth Moody. Waterfall Fun. Photo by Gwyneth Moody. Chattahoochee Hidden Gem. Photo by Gwyneth Moody.